ACCRA, Ghana – Who most deserves health care, education and retirement benefits? If a country’s citizens are supposed to be first in line for those things, a government needs to know who is a citizen and who isn’t. And in Ghana, it’s not always easy to tell. As one of Africa’s stable countries, Ghana draws lots of undocumented immigrants. The government suspects it is spending hundreds of millions of dollars each year on social services for people who aren’t entitled to them. Hospitals are overcrowded in areas around Accra, the capital, where the population is soaring, but underused in rural areas where the population is declining. Public officials consider fraud a national crisis. There are stories of businesspeople applying for loans under fake names, and poor people placing money in nonexistent banks. So this year, the Ghanaian government mounted an effort to identify every Ghanaian citizen, by issuing ID cards called Ghanacards. It’s being pitched as a way to dramatically cut poverty, by concentrating resources on citizens. 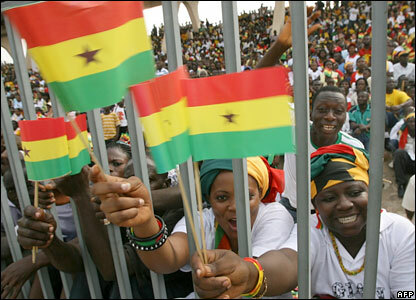 Officials also hope the project will help Ghanaians develop a sense of patriotism. The cards could eventually be used for voter registration or driver’s licenses, they say. “There’s no way for a Ghanaian to identify themselves as a Ghanaian,” said Bertha Dzeble, a spokesperson for the National Identification Authority. “We hope that this will give Ghanaians something to be proud about.” Australia, Malaysia and Botswana have tried issuing their citizens ID cards, too. It’s expensive – Ghana expects to spend $100 million on the project. It’s hard: A similar effort in 1972 was dropped when funding ran out. And it’s a challenge to convince Ghanaians, leery of government officials and fearful of corruption, to register. Poverty has fallen from 52 percent in 1991 to 39 percent in 1999. But only 60 percent of Ghanaians are literate, and rural poverty is a problem. The government has pledged to improve public schools, and to provide universal health insurance. Ghanacards will be required to go to school, establish a business and get public health care. The police also think they’ll help identify crime suspects. The aim is to issue a card to every citizen age six or older. The government launched a major public relations effort, advertising on the radio and in newspapers, and handing out flyers in churches and schools. Still, many people fear that the government will use the ID cards to collect taxes, and foreigners fear the government will use them to start kicking them out. There’s general fear of the government, due to past corruption incidents with police and government officials. “I heard that the government would cut me off from all services if I didn’t register,” said Kwaku Anam, a 35-year-old businessman. Many of the 29,000 registration booths were set up at post offices, downtown or in schoolyards. “We wanted to bring registration to the doorsteps of the people,” Dzeble said. The booths are staffed with several people, and are equipped with a laptop, digital camera and fingerprint scanner. On one registration day in Kasoa, a town outside Accra, people were lined up 30 deep. Registrars filled out forms, scanned fingerprints and took digital pictures. Francis Adjer, a 35-year-old carpenter, said fraud had been a significant fear for business owners in recent years.